I am in Haiti, I have adjusted to Haiti … what do you want me to do? Travel Blogs aspire to be somebody, to be a something, to be more than just one person rambling about his or her vacation. This is a new experiment; readers’ voting to send me to countries is a new theme for Travel Blogs. I can allow readers to choose my country and possible itineraries; this is a new twist of fate. Travel is one of the most selfish, self-centered, self-absorbed things to do on the planet, we do it alone, and all the decisions are made by me, you do not have any say in the matter, that is until now, I am giving readers the right to tell me what to do, better than normal for a Travel Blog. It seems you have failed to find any of the uninhibited joy that I experienced on that magic island 50 years ago, consequently resorting to a Blog of ations. Unfortunately, it now seems I must follow your advice and forget about a return Trip. How long are you planning to stay? Maybe there is hope on the horizon. Try Jacmel or the Cap. Emmy Die in a fire. or Haiti. Eva Patterson It would be a greater benefit to all travellers if you went. (and wrote) on Haiti. I'd like to go there too, but would be stronger in my conviction if I knew you'd gone before. Charlie It seems right now to be an exciting place for Andy. Very few people have traveled to Haiti. 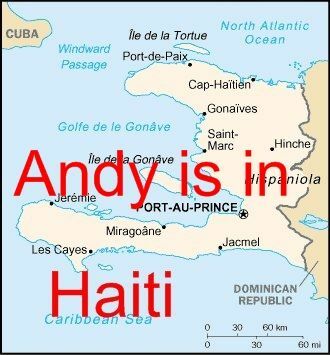 It will be interesting to read Andy's reactions to the people and places in Haiti. Ciara I was born In Haiti. Now is not so bad as before. Go to the mountains it is actually cold at night there and beautiful. Nancy Jones, Boston Why Not ? You have been to Iraq. How bad could Haiti Be? Linda I would like to see a real report from there and not one doing charity work or NGO work. Isaac Scheib A lot of witchcraft and voodooism there and would be interesting to find out what thats like? I think the timing is right to go now....before tourism sets in too heavily and makes visiting unpleasant. Thank you again for the all the postings. It's one of the few things that keeps my travel lust alive through the many months I'm tied to my regular office job. - This is not likely, unless I go stay in Five Star Hotels. - I want to know what specifically you experienced Robin. - I suppose this would make more reader read. 4. Benefit to all travellers. - I try to give transportation, hotel cost, then access the danger levels, then other travelers could decide whether to go. 5. Cheap by staying away from UN and NGO. Beaches are beautiful and so are the girls. - I agree with this advice on staying away from UN or NGO places, which is truthfully the major beaches. - Yes, perfect, there are tons of lies told by the UN and NGO so they get support and money. - I am trying to figure this one out, messing around with religions or politics are dangerous. 8. Before tourism sets in too heavily and makes visiting unpleasant. - I do not see this happening for at least 20-30 years after 2009, not until the road in and out of Port-au-Prince do not give you a great tour of slums. i had an interesting discussion about going to hell with Greg at the orphanage. Well, I assume we accept that one must sin to go to hell. "I am lazy, I do sin p, so I do not have to pray as much." I figure, people who pray a lot must be worried. I suppose people who want me to go to hell must want some company on their trip.